What kind of reputation does your church have? What is your dream for the congregation you attend? So many of us have such short-sighted goals for our churches. The church at Thessalonica was only a few months old and its reputation for sharing their faith had become known all over the Roman Empire. Now that's the kind of reputation I want the congregation I work with to have! How about you? O Lord God Almighty, please fill our congregation with the power of your Holy Spirit so that with sensitivity and courage we may share the good news of your grace in Jesus Christ. 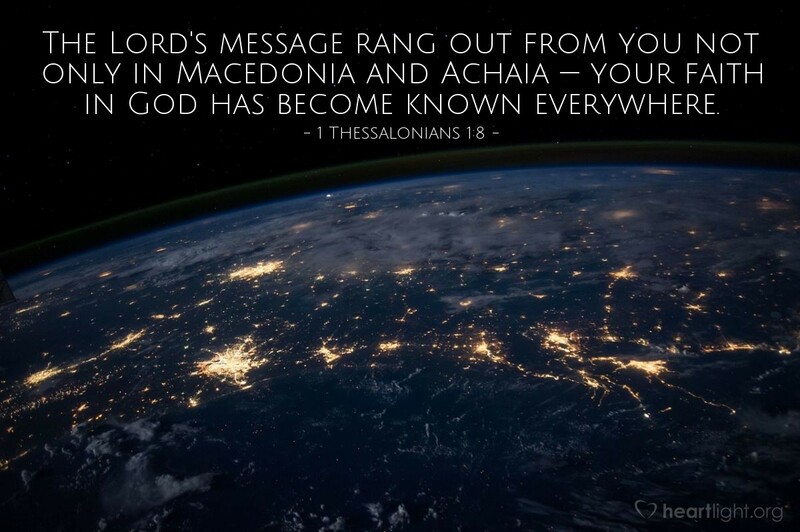 Please be with our missionaries, our ministers, and all of our members so that we may display and declare the Gospel of salvation to our friends, our neighbors, and people all over the world. In Jesus' name I pray. Amen.